For many adults, the mere idea of speaking in front of an audience is enough to cause anxiety. But for students at Rockhurst University, public speaking is not just a pre-requisite. It’s a competition — a decades-old, extemporaneous rhetorical “Thunderdome” called the Robert W. Miller Speech Contest. Every student in every section of the University’s introductory communication course — about 160 students per semester — is eligible to participate. At the end of each semester, all members of the sections vote to send the speaker with the best persuasive speech to compete in the Miller contest: a best-of-the-best showdown in front of an audience and a judges’ panel comprised of a graduating senior, a faculty member from outside of the communication department, and a staff member. The contest has its roots in both the original model of higher education, as well as the ancient Greek concept of the seven liberal arts, which included rhetoric. It was launched in 1975 with funding from the family of Robert W. Miller, a longtime instructor of communication at Rockhurst. Miller felt that effective public speaking was an essential skill for future student success, a building block for virtually any career. With the support of the Miller family to endow the prizes — currently $100, $50 and $25 for the three places, respectively — his passion lives on at Rockhurst. At the end of the semester, crowds of supporters rooting for contestants gather in one of the University’s large lecture-style halls to watch the competition. Changes in technology have changed the contours of the proceedings — interactive slide presentations now often accompany student speeches, underscoring factual arguments or buttressing main points. While some may fear that these changes threaten the classical idea of rhetoric, Rockhurst faculty believe that the Miller Speech Contest still invokes the qualities on which it was founded and offers many lessons on the importance of ethos, pathos and logos in the 21st century. Just as important as delivery is topic. There are some evergreen topics for a persuasive speech, but Bicak says that students are encouraged to explore a larger palette. As a result, the speeches take on unfamiliar subjects, often from unexpected angles. “Students definitely get creative,” says Bicak. That’s the central challenge of a persuasive speech — to connect effectively, in the moment, with an audience of mostly strangers — and it’s what makes the Miller contest exciting to watch and a privilege to participate. Getting there often involves taking extra time to perfect the argument, the outline and how it’s delivered. 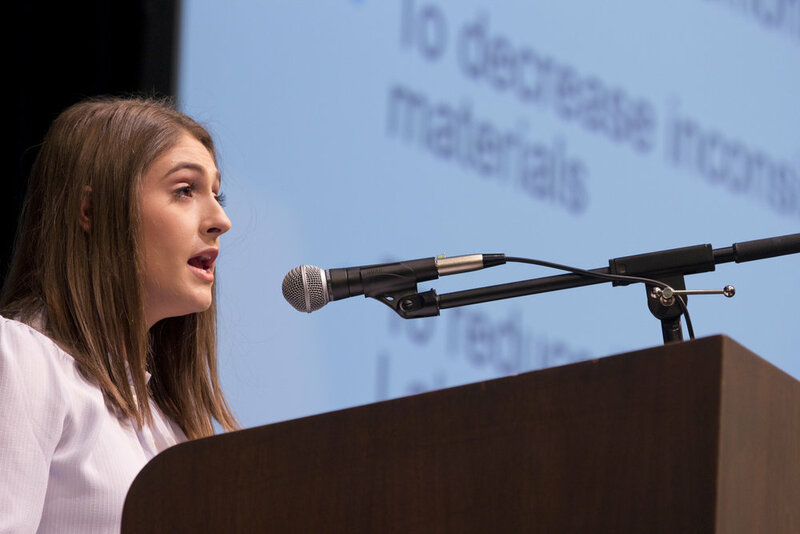 Sophomore Margaret Gerards won second place in the most recent competition, arguing against the industrial production of palm oil. Bicak says that’s a refrain he still hears from alumni who come back to visit, especially those who participate in the Miller contest. The skills that students learn through the process are ones that echo not only the tenets of good Ignatian conversation, but also Rockhurst’s liberal arts foundation.